Für diese Karte habe ich die folgende Karte von Laura Lunsford als Casing-Objekt gewählt. Ist sie nicht wunderschön??? Ich habe den Sketch und die fröhlichen Farben übernommen. Falls Laura meine Karte sieht: Ich hoffe sie gefällt dir!!! For my card I cased the following card made by Laura Lunsford. Isn´t it just too beautiful??? I went with the sketch and the bright cheery colors. In case Laura sees my card: I hope you´ll like it!!! Great cards! Love the little bee!!! Great coloring!! Thanks for joining us this week at Created With Love Challenges for our Winged Things Challenge! Your card is just adorable. Love your coloring and your choice of images. Thanks so much for joining us this week at Created with love challenge Winged things. This is so adorable, Love the cute design you cased as well. Fabulous coloring. Thanks for playing with us over at Loves Rubberstamps!!! You did an awesome job casing Laura. Thanks so much for playing at LRS! Super cute image love the bright colors! Thanks for joining created with love challenges! Very, very cute and I love your stitching. Thanks so much for playing with us at Bunny Zoe's Crafts. So adorable! Lovely coloring! Thanks for joining Loves Rubberstamps! Beautiful card! I love your CASE and the image and design papers you chose! Those new pencils look like so much fun & you did a great job with your coloring. ! I always love new mediums and tried water coloring with distress inks for the first time with my CASE...so much fun! Thanks so much for joining our challenge over at Loves Rubberstamps! 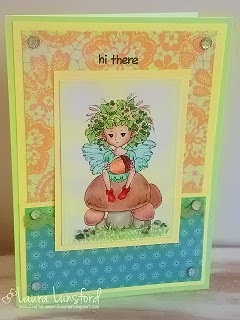 Very sweet card, I love the bright colors and how you matted your pieces with the yellow it sure make your image stand out.Thank you for taking the time and sharing with us at Whimsy Stamps for the something new challenge.